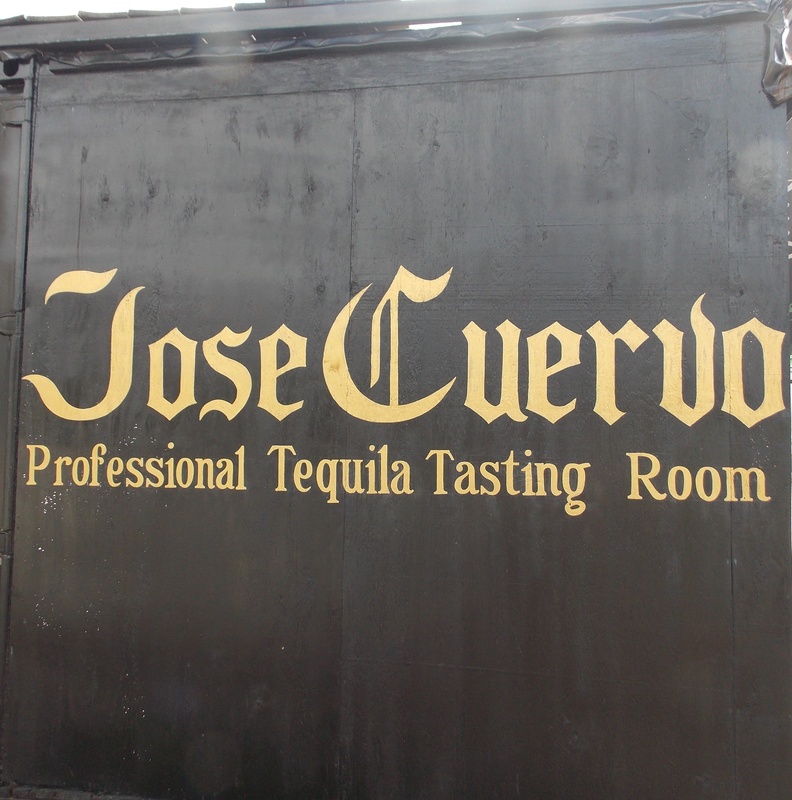 On a recent cruise of the Caribbean my husband and I took a shore excursion to the Jose Cuervo Tequila Experience in Cozumel, Mexico. As a long time tequila aficionado the opportunity to learn more about the varieties available was very appealing. Although my husband is a single malt Scotch lover he willingly joined me in exploring tequila. Neither of us was prepared for the fabulous experience at the Jose Cuervo site. 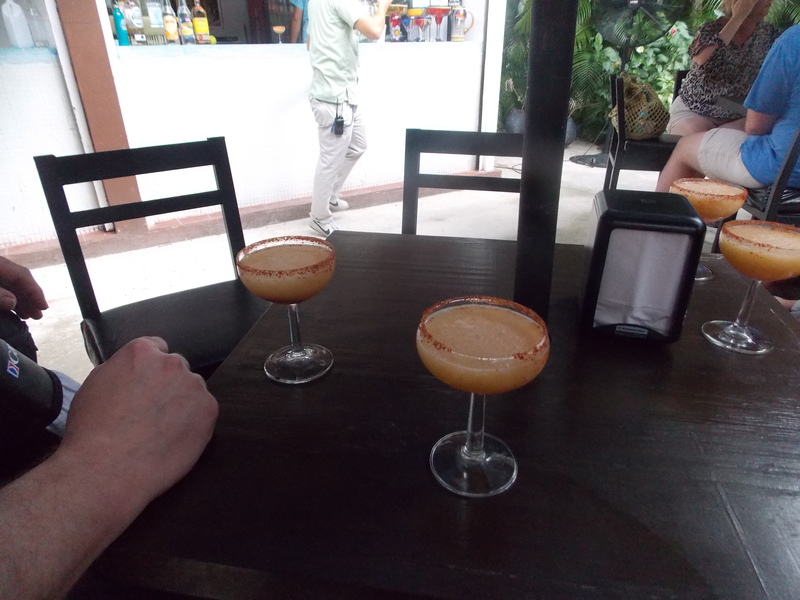 We were with a group of approximately twenty people and the tour began with a refreshing Margarita for everyone. After enjoying our beverage we were guided to the Jose Cuervo Professional Tequila Tasting Room by our knowledgeable guide Cesar. Seated at high tops in an air conditioned glass walled room we were given the opportunity to snap a few “before” photos. On the table before us was a placemat with three glasses, each containing a good amount of tequila and a small plate with plain crackers, coffee beans, and a lime peel. Cesar explained the interesting history of tequila from the original native drink to the fermentation process developed by the Spaniards. 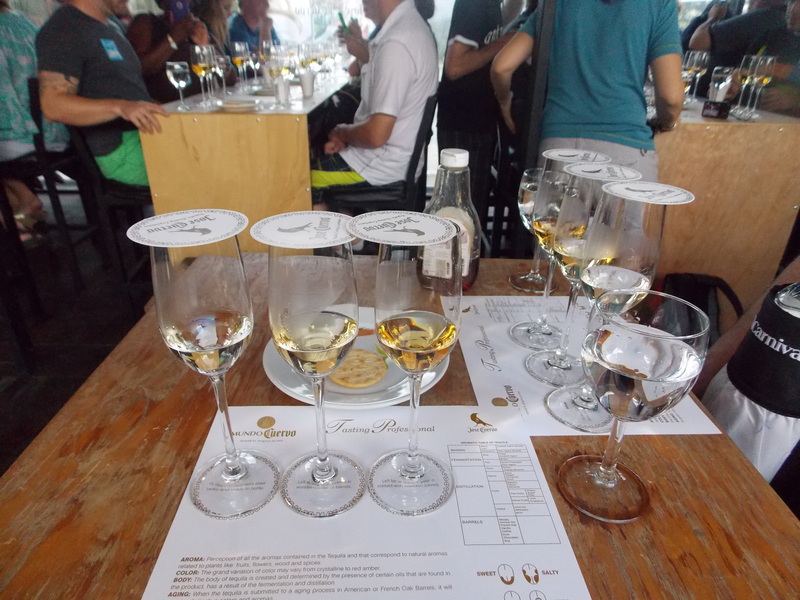 Cesar then took us through the steps Tequila Masters (Maestro Tequilerouse) use to determine the quality of tequila. We sniffed coffee beans to prepare us to judge the scent of the tequila, ate a small bit of the cracker prior to tasting the tequila, and used the lime for scent as well. As we went through the steps in sampling the tequila we found that there is indeed a great variety in types of tequila based on duration of fermentation, and parts of the blue agave plant used, among other factors. 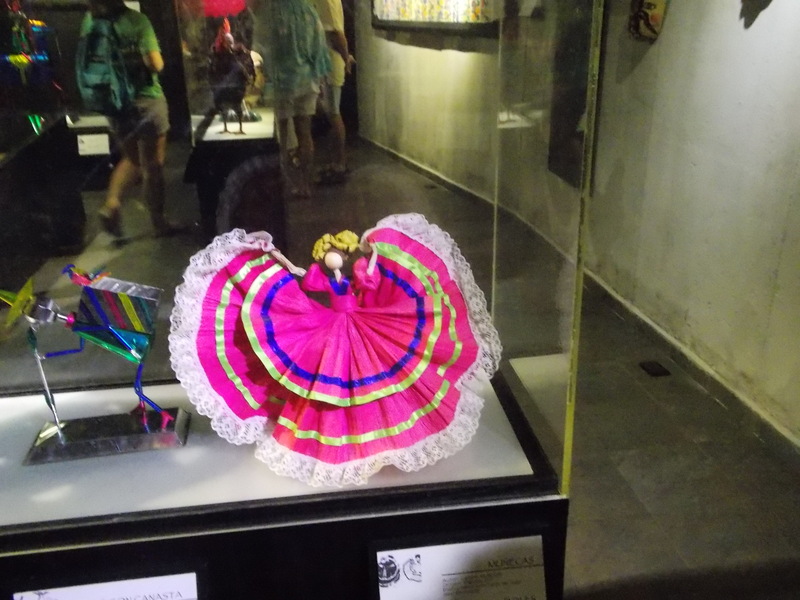 After our course in tequila appreciation we were given a tour of the museum which featured beautiful works of traditional Mexican art. Unlike many museums we were permitted to take as many photos as we wanted. Cesar explained the different parts of Mexico using a large wall map and showed the area of Mexico where tequila is created. Leaving the cool interior of the museum we were then treated to another taste of tequila, this time in a mango margarita with a chili powder rim and a dash of chili in the bottom of the glass. There was the opportunity to purchase another drink of any flavor we chose if we so desired. I opted for a guava Margarita and was delighted with the unique flavor. A taco buffet was provided with a delicious taco bar serving two cornmeal tacos with a variety of fillings to please any palate. 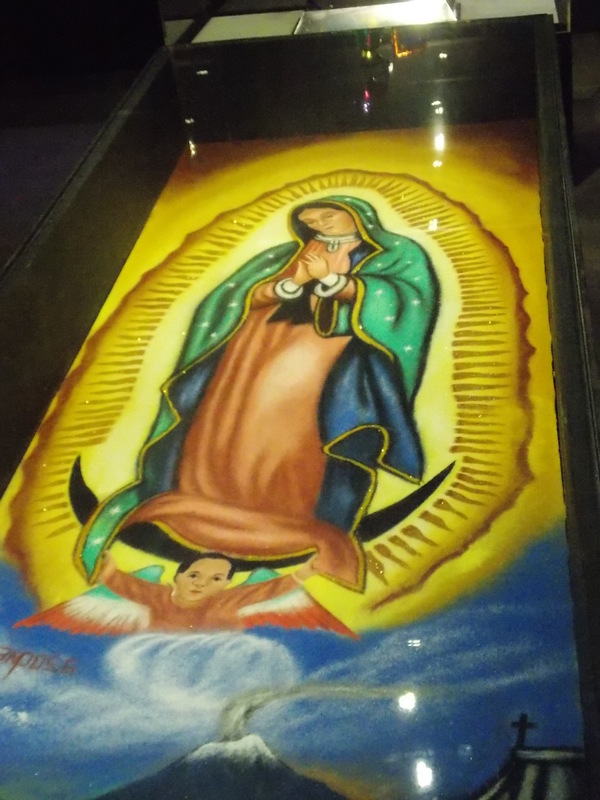 There were several vendors selling a variety of traditional gifts from jewelry to art works. 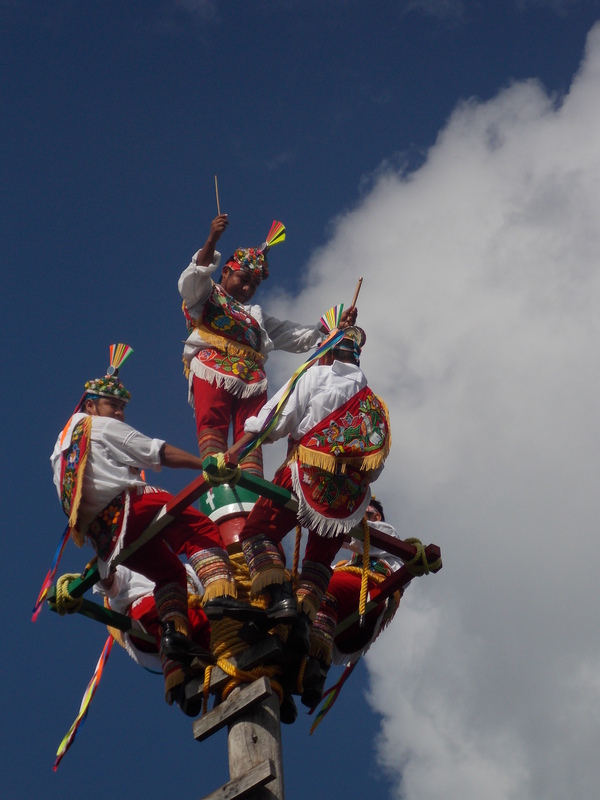 We were then escorted to a show by the Papantla Flyers who performed the ancient voladores ritual. This was absolutely breath taking as five men climbed a high tower and proceeded to spin while one stood and played a flute and small drum. 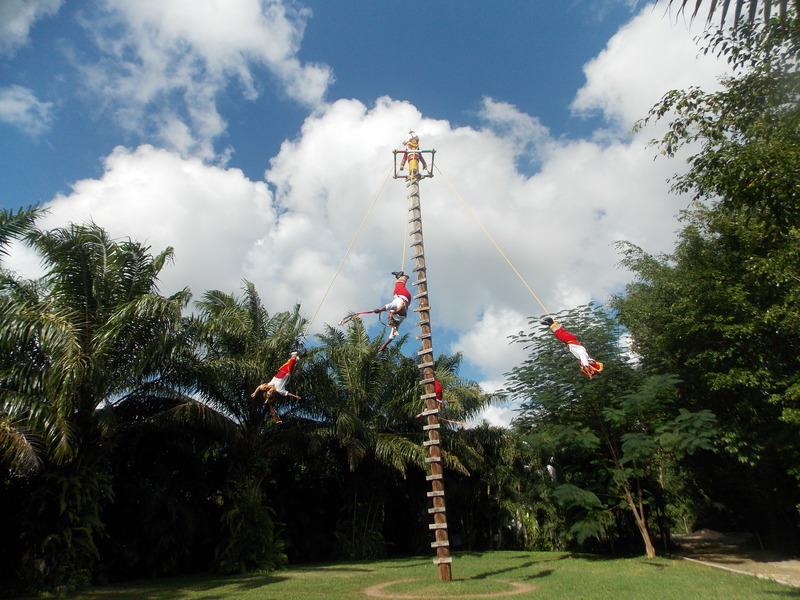 We were all holding our breaths as the performers descended head first at the end of ropes to the ground. At the end of the tour a trip to the gift shop was available as well as the chance to purchase any variety of tequila we chose all at a decent discount. We came away with a bottle of the Reserve de la Familia. As we left the park we were awarded certificates stating we had completed the workshop and were now Certified Tequila Connoisseurs. A short taxi ride back to port was provided by the tour. If you go to Cozumel I highly recommend this tour especially if you enjoy tequila. Even if all you want to do is learn about this drink and how it came to be the signature drink of Mexico you will enjoy the experience. Obviously this is not a tour for children.